A small band of British soldiers is sent on a mission to hold up a German advance. During the Korean War retreat in 1951, a small British recon group is surrounded by Chinese troops and holds out in a lonely temple atop a hill. A German Agent in Libya is allowed to get back to Rommel with false information. A blind American Army officer becomes involved in a murder mystery and solves it after regaining his sight. Feature writer Ray Savage is assigned to uncover the facts leading to the sudden death of Jayne Hayle. His investigations expose an intricate web of crimes and characters involved in a kidnapping, murder, and counterfeiting. Cabdriver Constantine falls for French girl mixed up with white slave ring, eventually helps to liberate her. During World War II, a recently widowed young woman is recruited to work as a spy in France. 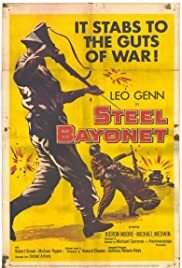 A reluctant hero, American Lieutenant Sam Lawson, is secunded to a motley British unit tasked with destroying a Japanese radio on a Philippine island. A group of crooks accidentally kill an elderly shop assistant while stealing the keys to the jewelry shop where she works.